A little late on last week’s post…my fault. Little early with this week’s post … not necessarily my fault. Apparently, it’s about to go down. Having a blast running. I mean, not just getting fitter and stronger, but really enjoying it. To the point where I can’t get wait to get outside everyday. Two-a-days no problem. I say this to say, when you find something you like, you gotta stick with it. Because passion’s hard to come across. At least for me. Not gonna preach more than that. 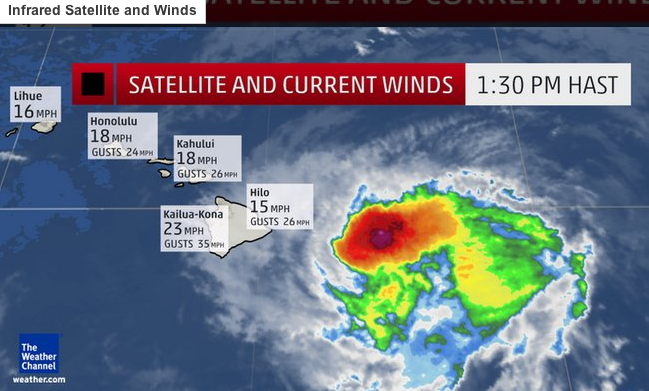 Two hurricanes (Iselle and Julio) are moving west towards the islands. Hoping that nothing comes of it. No one needs that kind of drama. At minimum we should get a lot of wind and rain. That said, best to prepare, right? Flashlights. Water. Food. First Aid. Check….No running. Check-minus. I see a lot of fitness memes out there lately about squats (“He squats”, “She squats”). About to become my go-to exercise. Tough to plan the rest of the summer going forward, but I feel confident that I’m in sub-20 5K shape. Confidence and speed comes with the speedwork sessions during the week. Going to get inside today and wait these out. Hit 48 miles in a week in late July-August. [This would have been the 48-mile week. Not going to happen. Oh well. ].